> Earth Science 15th Edition ©2018 with MasteringGeology with Pearson eText Tarbuck et al. Earth Science answers the need for a straightforward text that excites students about the world around them. Perfect for students with little-to-no background in science, the text covers geology, oceanography, meteorology, and astronomy clearly and without technical jargon. Instructors and students praise Tarbuck, Lutgens, and Tasa for their uncomplicated writing, dynamic media that help visualize physical processes, stunning art program that brings the “wow” factor, and valuable activities in Mastering Geology that provide activity-based learning to solidify students’ understanding. The 15th Edition incorporates the latest data and applications from earth science, new data analysis activities, and an updated dynamic mobile media and Mastering Geology program. 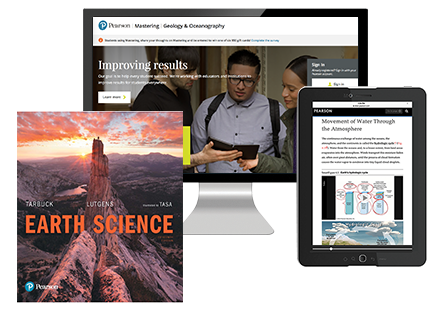 Personalize learning with Mastering GeologyMastering™ Geology is an online homework, tutorial, and assessment program designed to work with this text to engage students and improve results. Interactive, self-paced coaching activities provide individualized coaching to help students stay on track. With a wide range of activities available, students can actively learn, understand, and retain even the most difficult earth science concepts.